New Holland Island is a vast historic shipyard built by Tsar Peter the Great. Today it is both a relic and monument of the Russian technological enlightenment. New Holland Island has all the potential to be a cultural catalyst for the city. For that it needs to be both visible and vivid: a destination and an event. This does not require a fixed solution; instead MVRDV proposed a catalogue of possibilities, of natural growth and flexible use. The Iris Foundation has the ambition to fundamentally contribute to the contemporary cultural life of St. Petersburg, the wider region, Russia and the international cultural world. It has taken the admirable initiative to expand its success of the Garage Centre for Contemporary Culture in Moscow and convert St. Petersburg’s New Holland Island into a cultural district. MVRDV developed a strategy to gradually redevelop the historic structure and add a new volume dedicated to Modern Art. Inside the new structure a series of activators are collected, being released in summer activating the district. 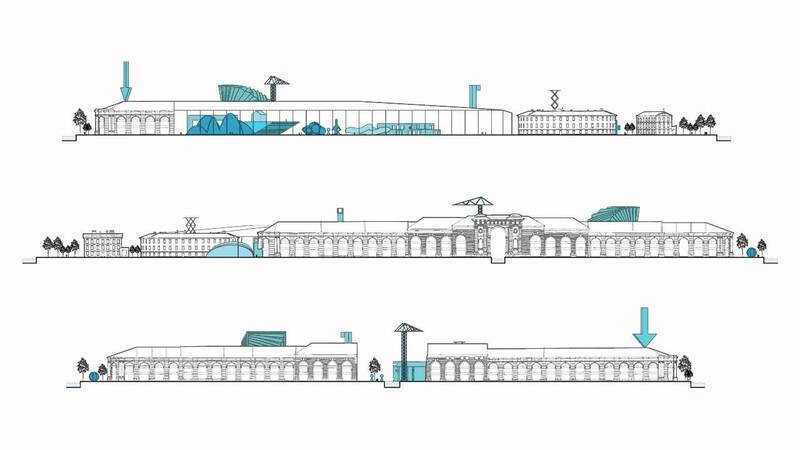 New Holland Island as curatable space, the informal and contemporary inside the monumental city, a cultural Trojan Horse. The historic buildings are treated with upmost respect as imposed by the UNESCO environment and economically upgraded in a gentrification strategy comparable to organic urban renewal on a larger scale. Chipperfield, Work AC, Studio 44 and MVRDV shortlisted in New Holland Island competition St. Petersburg.